Do you have a three to six year old who is not riding a bike yet? With the KaZAM balance bike your little one will never have to use training wheels. Watch our video demonstration, and you’ll understand why both toy experts and parents agree that KaZAM is the best balance bike and easiest way to teach kids to ride a bike. Watch the video and read more about the Kazam balance bike. Nothing says summer like water play… and what better way to play in the water than with a Waboba ball, the ball that bounces on water surfaces. Kids need to just go outside and play! We all grew up in a time when we were adventurers in our own neighborhoods, running around all day, making up games, and using our imagination to transform the world around us. Our kids need to just get out there, run around, have fun, and play Waboba! Since Waboba balls are so innovative and unlike anything kids have played with before, they give them endless opportunities to create their own games or even set up an obstacle course to try and achieve crazy trick shots, like bouncing a Waboba Surf ball off a water-filled cooler into a bucket. Yes, it’s possible. You only need a few inches of water to be able to play Waboba. Try big puddles next time it rains too! Waboba balls are great for engaging kids’ bodies and minds all while they are engaged in FUN! They help develop eye-hand coordination, reaction time, dexterity, strategic and tactical thinking, social interaction, imaginative creativity, cooperative learning and team building. What better way to stay cool this summer and have endless fun in the water? Plus, if parents are looking for some quiet time on vacation, Waboba balls are the way to go. Five best places to play with Waboba balls this summer (and why!)? 1. 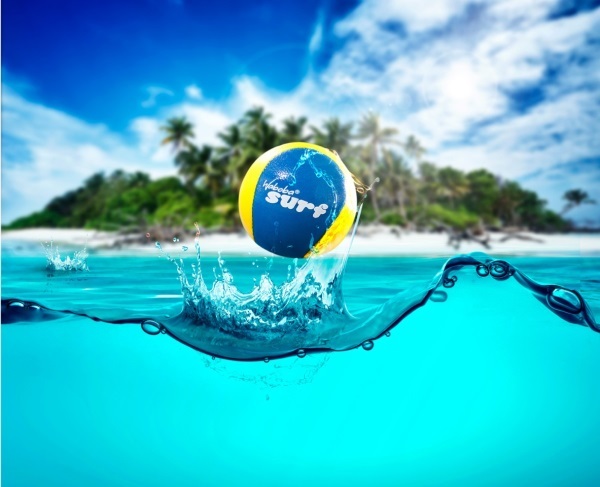 Beaches: Beaches offer various water conditions that allows people to experiment and try new tricks with the balls. Waves and ripples allow the balls to bounce higher or in random directions off the water, making catching them quite fun! You can spread out as far as 100 yards, and even try to bounce a Waboba ball off a wave to go 15 feet in the air! 2. Lakes: Since most lakes are very calm, Waboba balls bounce even farther. Plus, playing Waboba at the lake adds extra fun to usual water activities. We’ve seen kids challenge each other to see who can make the best catch jumping off a dock or even on wakeboards! 3. Pools: The Waboba Big Kahuna and Blast ball were designed with pools in mind. Set up makeshift goals or targets on either end, and you’ve got yourself a game with kids entertained for hours! 4. Rivers: Packing a Waboba Extreme is perfect for camping trips with kayaking and rafting adventures when you get to calmer waters! 5. Water fountains: Playing Waboba at a water fountain may not grant your wishes, but it will be fun and adventurous. I can’t tell you how many times we stopped to play on our various trips around the world. Never gets old!